Quantihub Elispot Plate Reader Semi-automated affordable solution to small-to-medium volume Elispot experiments. Software was developed using proprietary state-of-the-art image recognition and processing algorithms. 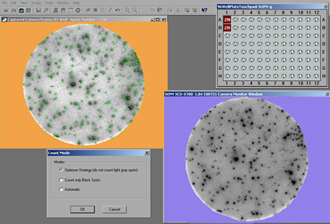 Allows to analyze 1- and 2-color Elispot plates developed with chromogenic detection chemistry. With a single click of a mouse it captures and saves images of wells with spots, quantifies them and saves data in a designated database from where it can be exported into MS Excel for advanced statistical analysis. Operator can add comments to saved images. Powerful database module allows to archive, search and retrieve large data files. If necessary, saved images can be adjusted using different filters and then re-analyzed and edited using manual quantification mode. Works with Windows 7, 8 and 10 operating systems.